Looking at the repertories of international puppet theatre festivals, it is apparent that the boundaries of the genre – as of most divisions of the theatre – are becoming more and more fluid. 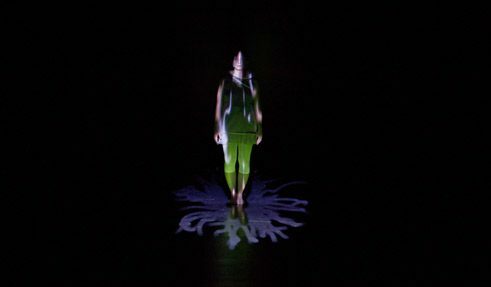 Artists such as Gisèle Vienne, Miet Warlop and Aurelien Bory, artist collectives such as AKHE, The Needcompany and BERLIN, are found at the most important performance and theatre festivals as well as at the major puppet theatre ones. The opening of the genre into an interdisciplinary scope is striking, and yet anything but a novel development. It lies rather in the specifics of the theatre form itself, which operates at an intersection of the arts and has always retained a certain resistance to divisional boundaries and formal classifications. Ivana Müller “While we were holding it together”; | Photo: Karijn Kakebeeke When a few years ago Ivana Müller’s performance While we were holding it together was invited to three international puppet theatre festivals, this made for some consternation amongst the professional audience. How could the inclusion in a genre-specific context be justified of a production in which not a single puppet, no object and not even material things of any kind appeared on the stage – only five actors who for 70 minutes acted almost motionless in an empty space? The answer of the festival organizers would probably have been as simple as it would have been surprising: this performance made central principles of puppet theatre experienceable in an astonishingly definite way. 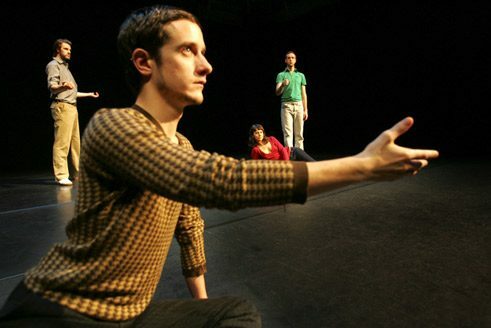 Not only the space between the actors was systematically staged but also that between the actors and the audience, a space in which both meet to become jointly creative: an imaginary space or “space of possibility”. This interstice is constitutive for puppet theatre, for this is where the dialogue between subject and object, the animation of seemingly inanimate things, the interplay between man and matter, takes place. meinhardt krauss feigl “r.o.o.m”; | Photo: Michael Krauss Among the pioneers of “digital puppet theatre” is the Stuttgart trio meinhardt krauss feigl; they themselves call the form “cinematographic theatre”. In worlds of virtual images the actors encounter enlarged and distorted details of their own bodies as in the play Intimacies, find themselves in r.o.o.m dominated by an intrinsic space or seek to situate themselves physically in a virtually generated universe as in And Suddenly the Sun Stood Still. The freedom or lack of freedom of the individual lies in the space in-between, at the interface of physical and imaginary body. meinhardt krauss feigl “Und plötzlich stand die Sonne still”; | Photo: Dirk Wilhelmy The dialectic of the man-object relationship not only opens its border and spaces; it also leads to friction and fractures: “It’s about a structural contradiction. As a medium, the thing in its concrete conditionedness will always behave as a friction towards the intended use. It will never fit completely”. So Markus Joss, Head of the Study Program for Contemporary Puppetry at the Ernst Busch University in Berlin, describing one of the basic principles of theatre work with puppets and objects. And he thus names one of the important “predetermined breaking points” from which a specific moment of performativity can be derived. In the lecture-performance Puppen sterben besser (i.e. Puppets Die Better) the puppeteer Florian Feisel applies just this resistiveness of the material to make basic principles of puppet theatre clear. 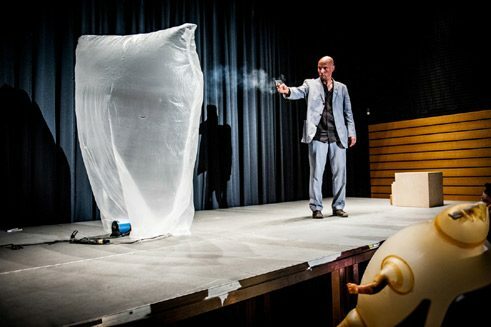 A quite ordinary plastic bag is elevated to the status of co-actor by having the actor give it an air-filled body and ask the audience to find a name for the resultant object. In the following playful examination, the object behaves very “willfully”, pursuing its own movement impulses, which can be only partially influenced by the manipulator. When the actor finally shoots the plastic bag before the eyes of the audience, it is again the object that, qua its material nature, duration and location, determines its death and so, up to the very end, asserts its status as an equal member of the cast. Contemporary puppet theatre, where the puppets are usually handled openly, that is, with the puppeteer visible to the audience, generates from the interaction of human and artificial bodies an interesting interplay of identification and the experience of difference. The puppet is connected to the puppeteer and appears as something belonging to him; at the same time its obvious material “otherness” marks a sphere of foreignness and the unknown. For example, the theatre puppet reveals this “eerie existence” in the German-Polish co-production Faza REM Phase by the puppet theatre Wilde & Vogel and the Grupa Coincidentia. Here it is nightmares and dream images that join the actors as partners and seem again and again to take hold of them. The “other” of the sub and unconscious parts of the personality takes on a physical form, clinging, in a very literal sense, to the bodies of the actors. Now it is a wolf’s mask that chases its bearer, now grotesque latex faces that are pulled over the faces of the actors and transform a tangle of their bodies into a nightmarish pandemonium. The structural resistance of puppet theatre generates alternative worlds and worlds of otherness that are capable of exerting continuing effects in social and political processes. This represents a great opportunity. To establish poetic interstices as places of social relevance remains the great future task of puppet theatre. Katja Spiess has headed the theatre management of the Center of Puppet Theatre FITZ since 1998, first in collaboration with Helmut Pogerth and then after 2001 on her own. She is also director of the International Puppet Theatre Festival IMAGINALE and member of the editorial board of the theatre journal “double”.